WebDiscover Browser is the PUP that uses misleading techniques to prevent removal. Use Reimage to locate malicious components and get rid of them faster than with uninstall instructions. A full system scan blocks virus reappearance and prevents traffic to malicious domains. How can it end up on my computer? WebDiscover virus is presented as an alternative browser that enhances user’s browsing experience because it allows accessing the Internet straight from the desktop. 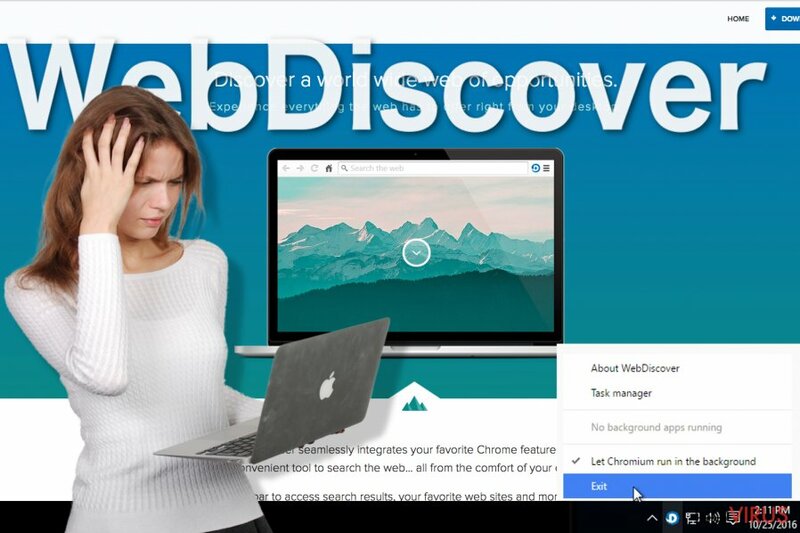 The developers, WebDiscover Browser Media, created their product using Chromium open source project and integrated various Google Chrome features and services. Indeed, it looks identical to Google Chrome. However, under reliable appearance hides shady and unpleasant activities. We do not recommend installing this application. Moreover, if it has sneaked into your PC mysteriously, you should remove WebDiscover immediately. This potentially unwanted program (PUP) was created for delivering sponsored content. So, you might receive lots of advertisements and encounter unwanted redirects. These activities not only disturbs browsing the Internet but can also put the computer at risk. The browser is not dangerous itself, but some initiated redirects and delivered ads might be malicious. 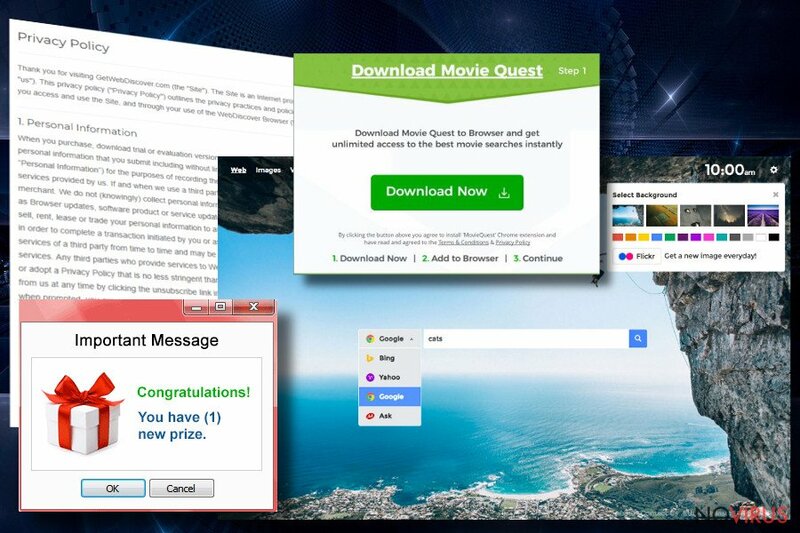 WebDiscover virus can be installed bundled with regular software or users can install it voluntarily. The browser creates a search bar at the top of the desktop which is always visible and accessible. Probably, you have a feeling that something should be wrong and suspicious about this search engine. Indeed, it is not worth using. Once you have typed necessary keywords, you will be redirected to the third-party website. Users claim that they have been redirected to safestsearches.com and trovi.com. But one redirect is not enough. From these sites, users are redirected again, this time – to Bing search engine. This WebDiscover redirect issue is strange and unusual. However, it can also initiate other redirects to promotional or questionable websites. Some of these third-party sites may cause serious computer infections. The best solution to avoid unwanted redirects is WebDiscover removal. Professional malware removal tools, such as Reimage or Malwarebytes MalwarebytesCombo Cleaner might help to eliminate this potentially unwanted program. 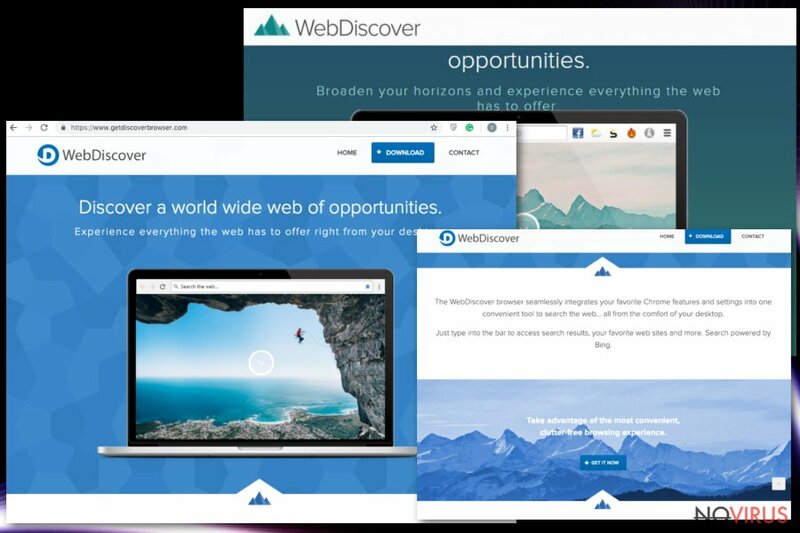 The developers of WebDiscover browser generate revenue from boosting traffic to third-party websites and delivering advertisements. Some of these pop-ups, banners or in-text ads are aggressive and interrupt browsing the Internet. The creators want to force users to click on sponsored content no matter what. However, users can easily recognise these ads and avoid them. They usually offer various software or toolbars and are labelled ‘WebDiscover ads,' ‘Ads by WebDiscover’ or similarly. Furthermore, this application might collect information related to users’ browsing activity and history: visited websites, search queries, IP address, etc. The biggest threat is that this information might be shared with third-party companies and it can lead to serious privacy issues. The developers add an application to regular software installers and hide under ‘Recommended’ or ‘Quick’ installation mode. If users agree to use this installation mode, all potentially unwanted programs are allowed to enter the system. To prevent it, you have to choose ‘Advanced’ or ‘Custom’ installation setup, because it presents a full list of optional programs and you can stop their installation. WebDiscover removal can be initiated both, manually and automatically. Our IT specialists prepared a step-by-step guide how to eliminate this unwanted program manually. However, we should warn you that this method is quite challenging and complicated. If you are not experienced computer user and do not have knowledge in PUPs or virus elimination, you shouldn’t try to get rid of this infection manually. You should remove WebDiscover automatically. This method requires installing malware removal tools and scanning the computer’s system. This potentially unwanted program mostly targets Windows OS users. WebDiscover is capable of hiding itself on the computer, so it might be difficult to find and eliminate. However, it is still possible! It is known that virus can hide in C:\Program Files\WebDiscoverBrowser\ and C:\Documents and Settings\\Application DataChromium\ directories. However, it might have installed additional components in other locations. You have to detect and remove them as well. 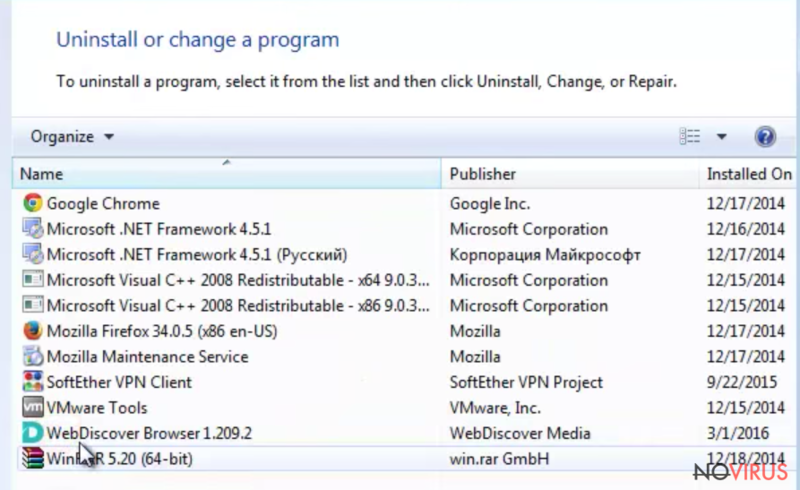 Now, take a look at the list of programs and find WebDiscover Browser or other programs that you do not remember installing. WebDiscover rarely infects Mac OS X devices. However, if you have encountered the virus, follow our prepared instructions bellow. Wait until you see Applications folder and look for WebDiscover Browser or any other suspicious programs on it. Now right click on every of such entries and select Move to Trash. Manage Add-ons window will appear on your screen. Now, search for WebDiscover Browser and other questionable browser add-ons. Right-click them on each of them and select Disable. A new window appears, and then you have to tick Delete personal settings and click Reset to finalise WebDiscover Browser removal. After completing these steps, Microsoft Edge should be WebDiscover Browser-free. Now, locate WebDiscover Browser and other suspicious extensions. Click Remove to eliminate them. Reset Firefox to its default state message should appear then. You will see Reset Firefox button. Click this button a few times and finalise WebDiscover Browser removal. Now, look for WebDiscover Browser and other suspicious extensions and then click the trash icon to remove them. Click Reset to approve this action and finish WebDiscover Browser removal. Here, select Extensions and look for WebDiscover Browser or other suspicious entries. Click on the Uninstall button to get rid each of them. Now you will see a detailed dialog window filled with reset options. All of those options are usually checked, but you can specify which of them you want to reset. Click the Reset button to complete WebDiscover Browser removal process. This post was published on 2019-04-01 at 01:08. Category: Adware, Viruses. You can quickly scan the QR code with your mobile device and have WebDiscover Browser manual removal instructions right in your pocket. 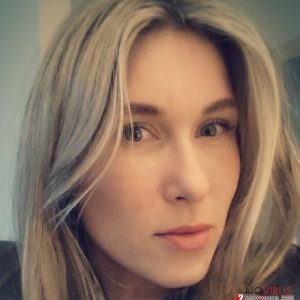 What method did you use to remove WebDiscover Browser?